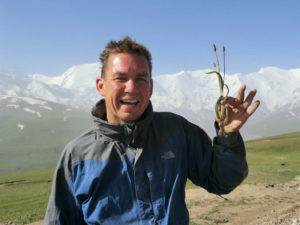 Day 56 took us from our camp site between Ulugqat and the Chinese border, to a mountain camp in Kyrgyzstan. The next day we cycled from camp to Sary Tas, the first and for us the only village in Kyrgyzstan, where we stayed in a ‘homestay’. This was one of my best cycle days ever! What a great country Kyrgyzstan is! 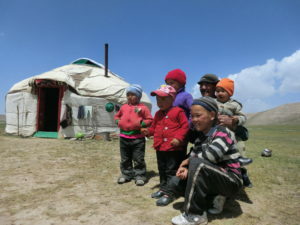 The first day in Kyrgyzstan was such a change! 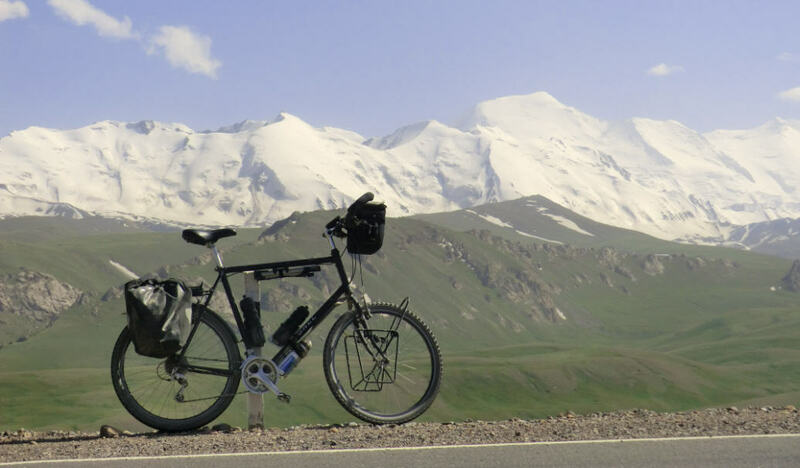 After crossing the Kyrgyzstan border, the cycling experience totally changed. All of a sudden I was riding on a decant road, no construction work, and with just a few trucks the whole day. The lack of trucks was probably caused due to the border which is closed on Saturday and Sunday but I didn’t mind! It was a relief! And then the landscape: green, lots of flowers along the road side, great mountain views! 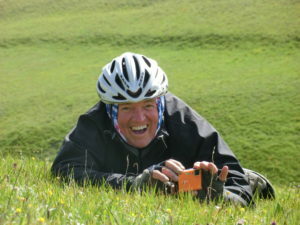 There were some long steep climbs and quite often were there sign saying ‘8% climb ahead’. The wind didn’t make it easier, but then again, I was really enjoying this! Due to the diarrhea I was still a bit weak so I arrived in camp late in the afternoon. Another relief: no sand or dust! We were camping on real grassland! The second day in Kyrgyzstan was one of the best days so far! 7 Kilometer out of camp I stopped and walked through a little valley into some snow. Still remembering the Chinese desert, it was such a great feeling to sit in the cold cold snow! You can’t imagine! The little hill was full of all sorts of flowers so I took my time before going back to the road. It’s going to be a long day J. Back on the road I noticed some flowers I haven’t seen before so I went down to have a look. And guess what? I also noticed some wild tulips! With no tools other than a rock I was able to dig out 3 tulip bulbs! So happy! This was the only real souvenir I was hoping to find along the silk route. The tulip originally comes from the Tien Shan and Pamir mountain range, just along our route! It is said that the tulip traveled along the Silk Route to Istanbul and from there into Europe. Carolus Clusius planted tulips at the Imperial Botanical Gardens of Vienna in 1573 and later at the Leiden University’s newly established Hortus Botanicus, where he was appointed director. There he planted some of his tulip bulbs in late 1593. As a result, 1594 is considered the official date of the tulip’s first flowering in the Netherlands, despite reports of the flowers being cultivated in private gardens in Antwerp and Amsterdam two or three decades earlier. These tulips at Leiden would eventually lead to both Tulip mania and the commercial tulip industry in Holland. At the top of the next climb we met Catharina. She we doing the sweep today and she waited in the cold wind until we were finished laying in the warm sun. The four of us continued the ride and enjoying the spectacular views: the mountains with snow on top, the hundreds of sheep walking through the remote landscape, the yurts in the far distance and of course all the flowers along the road. As we climbed more, I didn’t see any more tulips unfortunately. Somewhere along the road, with a great view on a few yurts, we stopped to eat Dudley’s sandwiches and my chocolate. It was such a great view to see the kinds play with a donkey with a sledge, that we went over to say hi. This family was so friendly and I was overwhelmed by their hospitality. They invited us for a second lunch: bread with some kind of mayonnaise/butter/yoghurt, yak butter, tea, some kind of fermented horse milk (it wasn’t my favorite milk, but I did my best and drunk half of the bowl) and watermelon. The inside of the yurt was beautifully decorated with carpets and paint, something I never expected. So, quite late in the afternoon we arrived in Sary Tas. A small village with nothing to do. A great place for a rest day! Instead of the Chinese hotels we stayed in a so called ‘homestay’. Basically a house with some additional extra-large rooms with ‘beds’ (sleeping on the ground). I shared one of the old rooms with Bob, and after a day like this, I slept really well!